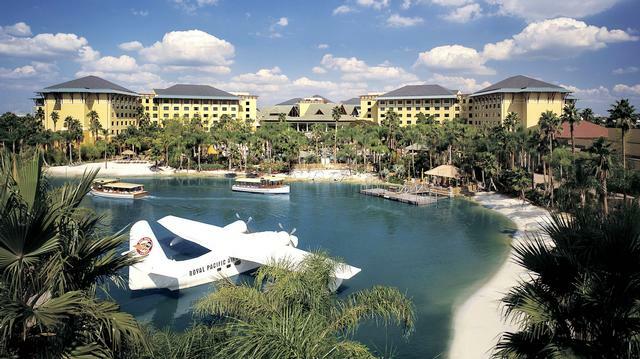 Universal's Royal Pacific Resort is a four-star deluxe hotel at Universal Orlando. This Universal hotel, with a tropical theme, is often priced more moderately than the neighboring Portofino Bay and Hard Rock hotels. Guests enjoy front-of-the-line access to almost all attractions at Universal Studios Florida and Islands of Adventure, which stand just a short walk, or water-taxi ride, away. We just returned from a stay at the Royal Pacific. We stayed at the Hard Rock in a previous visit, and really enjoyed the tropical theme of RP. The rooms have been recently updated with tons of plugs and USB outlets everywhere for your gizmos. The bathroom was very well appointed with a fully tiled shower (wall and hand sprayers). We stayed on the 6th floor of Tower 3 as a "club level" reservation, which was a bit annoying since the club is on the 7th floor, but the quick ride up and down the elevator wasn't a huge deal for us. The pool is very nice but is lacking slides in the kids' play structure. The lobby is not a breathtaking as most Disney Deluxe hotels, but was very nice, and reminded me more of a Vegas-style resort than what Disney's huge 8-story lobby/atrium designs. The walk is a bit of a slog compared to the Hard Rock, but considering rates at the RP are typically 10-20% less than HR and PB with the same level of perks, the extra few minutes getting to and from the parks was a small price to pay for a cheaper room. I highly recommend staying at the RP if you're interested in securing Universal Express for your entire family. The club level rooms are an extra splurge if you plan to take a mid-day break or are interested in having a few light meals included in your hotel cost.